“Inadequate” is such an insipid inadequate term to describe an abject failure to manage critical mental health services and to continue over 5-years to fail to improve. services across 50 sites and GP practices for 1.6 million people in an area of 3,500 square miles for £227m a year. In any one month they may have 25,000 patients being seen or served. No small feat. I’ve had great NHS care and compassion, supported by superb individuals via NSFT, Wellbeing, CMHT, Therapy services within Norfolk Mental Health – indeed CQC scored it “Good” for caring. However, the waiting lists for many are criminally irresponsible. This isn’t even my usual rant about transgender waiting lists, although they form a part of mental health. 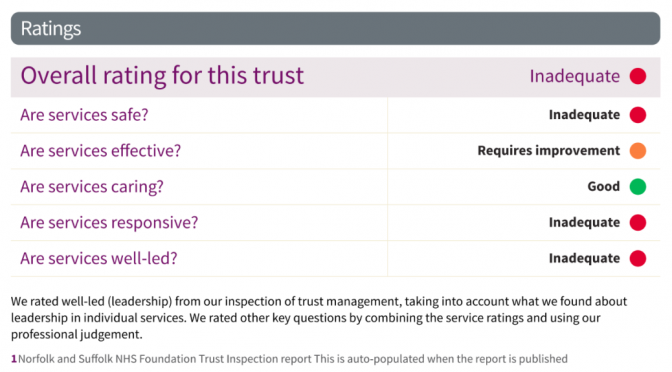 The Government austerity cuts and CCG and NSFT financial and provision managers are presumably to blame as every other trust must be facing similar challenges. Mental Health services remain grossly underfunded and in crisis. Parity for mental health services with physical health and its 18-week guarantees are years away. NSFT tops the table in the worst possible way, making national news today. 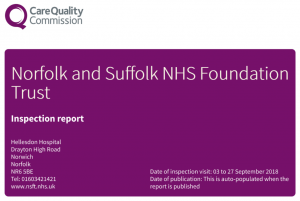 Norwich topping the football – great; NSFT topping the worst mental health care trust for 5 years – fail! I had to fight for well over a year to get seen, assessed (I was “lost” in the system three times but with zero response to internal complaints raised), and keep my care – which I am losing in 3 months – apparently, long-term mental health symptoms can be in “recovery” (mine can be episodically), and bipolar and anxiety disorder be signed-off. This is the problem when capitalist market budgeting is applied to health, and recovery models applied to long-term ailments. I prefer a “discovery” model that supports but doesn’t focus on discharge until you yourself know you are ready. Instead, a benefits and unemployment model of punishing mental health as if it was an aspect of an alleged “work-shy” culture leads to shaming those in need of its services and a seemingly deliberate or incompetent policy of actually signposting ease of access to services resulting in many people never even finding the door, let alone making it through it. Whilst I am currently being “shown the door“, having had an exit strategy meeting, others are shown the door but not let in. As many friends of mine know all to well, just as with PIP applications and appeals, if you weren’t ill when you asked for help by the time you eventually get it the very wait will have made you ill, and certainly resulted in a deterioration of any conditions you have. During a suicidal day, several years ago, I rang the 24hr acute line at Hellesdon on a Friday night and got a locum of some form who said: “I can’t help you, I can’t access your notes at a weekend” and was generally unintelligible and useless in several other ways. I never rang them again. With a history of suicide, I’ve learned to stay alive by building my own care package and it includes my partner, friends, Wellbeing, CMHT – the “severe and enduring mental health needs” service (keeps getting renamed! ), cats, honesty, whisky, and avoiding pills as an accessible suicide kit. I have nothing but praise for 95% of the frontline staff who’ve helped me. I would not have survived continuing mental health challenges and rebuilt some of my life had it not been for my care team who have gone above and beyond their job descriptions to support my whole wellbeing and not just my mental health. That has included helping me with referrals to physio and general health, and applying for Housing Benefit, PIP and ESA for me, when I was in no state to do so. They are my heroes. The system of cuts and carelessness elsewhere that meant I needed them has probably meant that others have had less support or are still waiting. Clearly, they are people that carry on caring despite the system and resources they are forced to work with. It is a wonder why so many keep working and don’t leave. Indeed, NSFT has 1-in-4 unfilled nursing posts. When the CQC interviewed me for a previous report, I said that continuity (and accessibility) of care were critical as my care team kept getting changed or staff going off long-term sick themselves (probably stress at work based). What happened? Three months later they shuffled the deck chairs (a “radical redesign” no doubt) and changed my care-co again, and I’ve had 3 more since. NSFT is that Titanic on which the deck-chairs get regularly rearranged rather than addressing the approaching iceberg of yet more service-users drowning in a cold heartless sea where the lifeboats are knocked-off the list of necessary equipment to save money. This month saw World Mental Health Day. For the other 364 days of the year, we are forgotten. Austerity Britain has affected mental health services more than most. 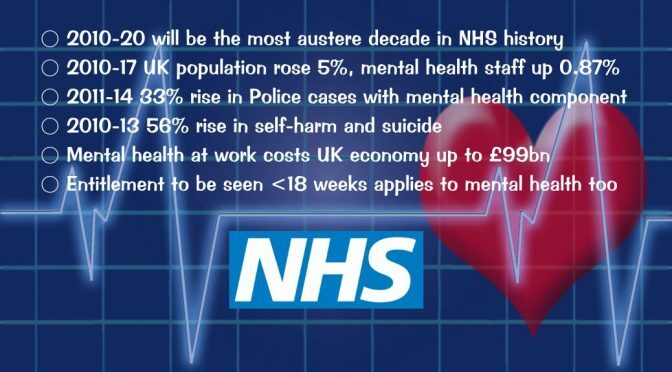 Despite promises to ringfence the NHS and bring parity between physical and mental health, this has not happened. Instead, beds have been cut, jobs have not kept pace with population growth, and my own trust, NSFT, has been placed back into special measures again, after being the first mental health trust in the country to be sanctioned in this way by the Care Quality Commission (CQC) in February 2015. Mental health awareness and NHS service provision improvements are sorely needed as referrals have risen 20% in Norfolk and Suffolk, but staffing and beds have been cut. Complaints, locally, have risen from 430 to 592, 2013-16. The latest CQC report criticised inadequate staff and bed levels but praised staff the caring attitudes of staff as ‘good’. The recent Stevenson/Farmer ‘Thriving at Work’ report has demonstrated the need to promote mental health at work due to its annual near £99bn cost to the UK economy. This makes the failure to resolve the local NSFT crisis all the poorer. Patients, or the politically correct – ‘service users’, have complimented the staff but criticised the system, waits, and other failures. Patient deaths and out of hospital suicides have increased whilst beds and budgets have been cut. Hundreds of patients were sent out of county owing to the lack of beds, up to 225 miles away! In 2012/13 the trust reported 53 unexpected deaths, 105 in 2013/14 and 14/15, 139 deaths, rising again in 15/16 to 158, and 140 in just 9 months of 16/17. When standardised for age it is above the average for England. The figures have risen across all regions during NHS austerity under this government, from 47 per 1,000 to 59 in England – up 25%, but from 44 to 66, a rise of 50% in Norfolk & Suffolk. Jeremy Hunt, the Health Secretary, has boasted that provision for mental health has “got better” and that he has increased staffing by 30,000 posts. The reality of the lie, and statistics do indeed damn him, is that 4,100 mental health nurses, 4,596 mental health trust beds, have been cut, and just 692 extra staff employed – an increase of just 0.87% over seven years, despite population growth of 5% during that time – so, in other words, a cut! In Norfolk and Suffolk, primary care mental health referrals rose 20% between 2013-16, nearly 7 times faster than the population increase. Norfolk has a pioneering mental health within Police HQ service, but nationally, there has been a 33% increase in cases with a mental health component 2011-14. As much as 40% of Police time is spent dealing with mental health-related issues. Under the NHS constitutional pledge, patients have a right to be treated within 18 weeks of referral, including mental health. “the new waiting time standards will be as follows: 75% of people referred for talking therapies for treatment of common mental health problems like depression and anxiety will start their treatment within 6 weeks and 95% will start within 18 weeks.” Pledge of 2014 to be delivered by April 2016. Yet, the wait for some treatments can be more like 18 months. Just try requesting something more complex than CBT or other less time-limited ‘quick-fix’ therapies. IAPT referrals seen within 6 weeks were apparently 93-96% in Norfolk and Suffolk. My personal experience, and that of several friends, has been of much longer waits. Calling the acute care line at weekends can result in complete ignorance or lack of access to your medical records. Support lines have historically been cut. People fall between the cracks, and I know too many people no longer with us due to mental health funding and systemic failures. Discharge centred mental health, is solution based, with as much an an economic imperative as a wellbeing focus. Mental health in Norfolk has a Recovery College, a course-based approach to improving wellbeing. I prefer to see it as a discovery-centric way of improving self-management with community support. Some mental health issues do not just resolve, yet the NHS insists on “developing a recovery culture” (p13) in mental health which fails those with long term or lifetime conditions. 74% of NSFT patients represented with mental illness symptoms within 6 months, compared to a national figure of 63% (2015 data). IAPT (Improving Access to Psychological Therapies) approaches such as CBT serve best those with mild to moderate conditions, whereas moderate to severe need additional and more specialised help, as e.g., with OCD. Between 2010-13, there was a 56% rise in self-harm and suicide across 52 NHS mental health trusts. It has been suggested that the over-capacity of up to 138% and staffing cuts has increased the risk of incidents. What worries me, is the low level of funding, of staff, of beds, and the cure rather than care attitude of the system. In contrast, the caring attitude of the staff is to be praised, and they need additional in-work support themselves to be able to deliver services under such tight austerity conditions.